Shalom, chaverim! It's hard to believe, but Ulpan is now over for us. We took our final written exam on Wednesday, and now we have to wait for a month to get our results. Taking the exam was a sweaty and somewhat gruelling process, frankly. There were two sections, each lasting 75 minutes. The first section involved reading three essays of increasing levels of difficulty, then answering reading comprehension about them. The second section contained questions about grammar, and two impromptu writing exercises. The exam began at 1:00 p.m., at the height of the day's heat, and ended at 4:00 p.m. When we were finished, we staggered home and flopped down in exhaustion. However, we realized at the last minute that we needed to visit the Ministry of Absorption to check on the status of our benefits, now that we'd completed Ulpan. After rushing to meet with our Absorption Counselor, we now have appointments scheduled with her to discuss our options regarding further training and job-finding assistance. I've already submitted my resumes for two different positions and have gotten one callback so far, so I've plunged into my new life as "fulltime jobseeker" in less than 24 hours after finishing the course. The day before the exam was very pleasant, as our brief lesson was followed by a classroom party. Plenty of fruit, cookies, and fabulous Russian chocolates were on hand, as well as soft drinks and a mysterious brown liquid that tasted somewhat like beer. Fortunately, one of our classmates, Elena, was on hand with a camera and got lots of pictures. So without further ado, I'd like to introduce you to some of our peers. Seda, always punctual, impeccably groomed, and with well-organized notes. Seda is a very interesting and enigmatic woman from Russia. She is a lawyer by profession, has a sharp mind and incisive wit, and was one of the strongest students in the class. She shlepped all the way from Ma'alot to Nahariya for class every day, fighting snow, rain, heat, mosquitoes and late busses, and never complained once. I have no doubt that she will do very well here, as she has the work ethic of General Patton. Elena, our class photographer, with our teacher Yael. Elena is the first person I've ever known from Siberia. Of all things, her son has just returned to Russia after a stint working for Halliburton in Texas. 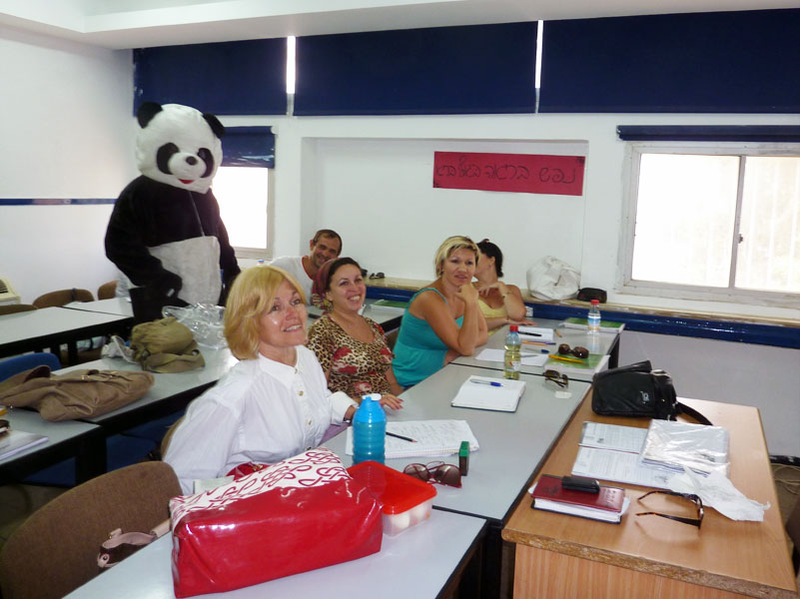 A typical day in Ulpan. Close quarters and un-fancy surroundsings, but lots of work gets done. Sitting behind Elul and me are Bekkeleh and Dereseh, two young men from Ethiopia. They are kind, quiet, work hard and generally keep to themselves. The panda in the back of the class is Yuli, a comical fellow from Belorussia. In addition to his skills as a massage therapist, he also does a mean impersonation of a chicken. 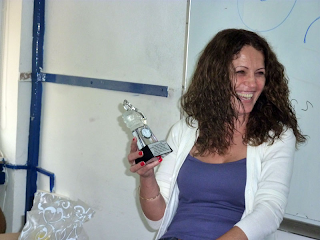 Our fearless teacher Yael, holding a crystal "thumbs up" trophy/clock we gave her as a token of our appreciation. I wish each and every one of you could meet all of our classmates. There's Guzal, for instance, who is both a dentist and a lawyer. There's Rodika, from Romania, an artist who married an Israeli and who now works as an egg-collector at a nearby moshav. There was Gaby, a Mexican woman married to an Israeli she'd met who'd been working as a bodyguard for a gazillionaire in Mexico. We had agronomists, economists, people with online businesses, teachers, linguists, computer scientists, telemarketers--all sorts of people. We even had a Lebanese Christian man who fought for Israel twelve years ago and who was given asylum here. He managed to find work at a hospital in Haifa and taught himself to speak Hebrew, but came to Ulpan because he wanted to learn how to read and write the language properly. The dedication and courage of our classmates never ceased to amaze me. So, chaverim, let me say this. If you plan to make Aliyah, I strongly advise you to do two things. First, learn as much Hebrew as you can before you arrive, even if it's just a few words or phrases, or just learning the alphabet. Rosetta Stone is useful, Pimsleur CD's provide lots of speaking drills and the chance to learn by rote, and there are often Hebrew classes offered by synagogues or Jewish Community Centers. 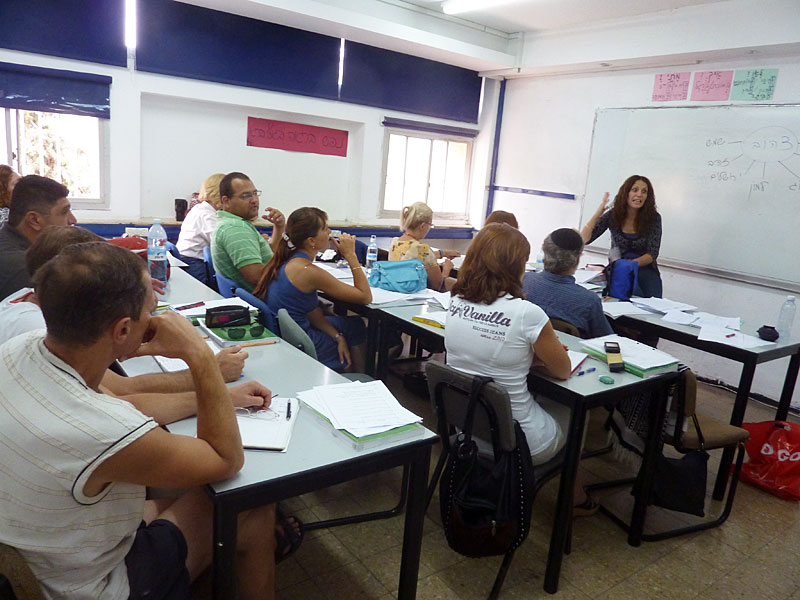 Second, once you get to Israel, make Ulpan your number one priority in life while it's going on. In other words, make your life fit around Ulpan, not the other way around. It is far too easy to never get around to doing it, or to quit before you finish. 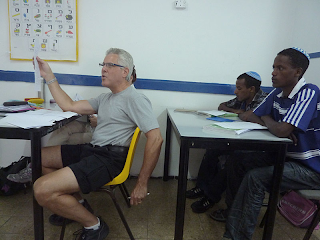 Yes, Ulpan is hard. It's challenging, it usually goes too fast to really master what you are learning, and you don't get much practice in speaking. Your class will probably be dominated by Russian speakers, and if English is your native language you will be outnumbered. Whether you get a skilled and experienced teacher or not is a crapshoot. We were exceedingly lucky to have had Yael and Galit as our teachers, I know. But despite these drawbacks, Ulpan will give you a strong foundation with which to continue your studies. You will be able to read more Hebrew, speak more Hebrew, and understand far more Hebrew after you've finished the course, I promise. But you will need to come to class every single day, pay attention, take notes, and do your homework. Essentially, you must treat it like a job and give it the same respect you'd give to your job.